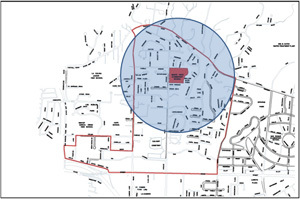 Ideally, the school zone starts at the front door and encompasses the campus and as many blocks as possible that surround the school and have a high concentration of school-generated traffic. Often the school zone includes the streets along the school and usually the area one to two blocks around it. The school zone should be marked with special signing to alert drivers of the high concentration of children. School crossing signs, speed signs, school zone pavement markings and other traffic calming devices remind drivers to treat the area with special care and attention. There are generally three zones around the school that you need to think about when doing a Safe Routes to School project: the school enrollment boundary, the school walk zone, and the school zone. The school enrollment boundary is the entire zone around the school from which students are drawn. School enrollment boundary. Image provided by Dave Parisi. School walk zone. Image provided by Dave Parisi. 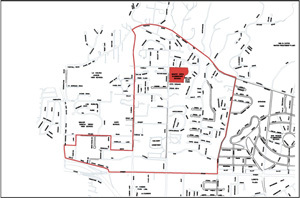 The school walk zone is typically a subset of the enrollment zone. School walk zones may be defined by State or Local policy, but if not, a general rule of thumb is that the walking boundary is 1/2 mile or 1-mile out from an elementary school, sometimes further for middle and high schools. The shaded circle on the map above is intended to provide a visual of a “walk zone”, but rarely is the walk zone an exact circle. Some students will live too far away from the school to reasonably be expected to walk, and they are typically provided with bus service. Walk zones defined by policy typically indicate the area within which students are NOT provided with bus service (note that some schools may define this as the no-transport zone, not the walk zone). Determining walk zones, whether policy based or through the general rule-of-thumb, can be helpful in focusing your efforts in identifying engineering problems and solutions. 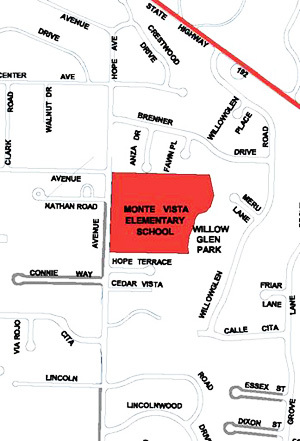 The school zone is the roadway (or roadways) immediately adjacent to the school (shown in red on the map above), usually extending one to two blocks in each direction. 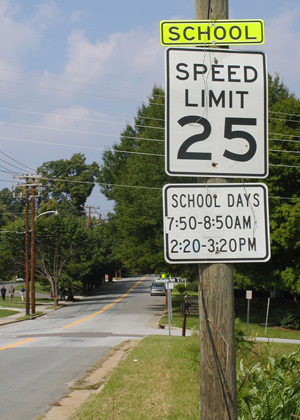 Speed limits are often reduced in the school zone during morning and afternoon hours. Special signing is used - crossing signs, speed signs, school zone pavement markings - so that motorists know to treat the area with special care and attention. Existing Conditions Map. Swansfield Elementary School, Howard County, MD. Image provided by Jennifer Toole. Prior to identifying engineering problems and solutions, it can be helpful to have an “existing conditions map” that identifies where existing sidewalks and pathways are located, where crossing guards are located, and where crosswalks and traffic signals are located. Partners in your local traffic engineering department may be able to provide or create such a map. If not, parents and school staff can conduct a simple walk audit of areas in the walk zone to begin to document existing conditions and identify major concerns. 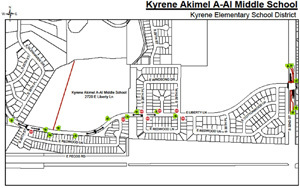 Comprehensive traffic control plan for Kyrene Akimel A-Al Middle School in Phoenix, AZ. Image provided by Mike Cynecki. A comprehensive traffic control plan - like this one - can benefit the Safe Routes to School program. Comprehensive traffic control plans lay out proposed signing and pavement marking measures, taking into account key streets surrounding the school. These school traffic control plans can also be used during annual school checks of signs and markings. School zone signs and pavement markings provide important information to drivers to improve safety within the school zone. The 2009 Manual on Uniform Traffic Control Devices for Streets and Highways (MUTCD), Part 7 sets forth principles and standards for controlling traffic in school areas, although many states and local jurisdictions provide additional guidance. 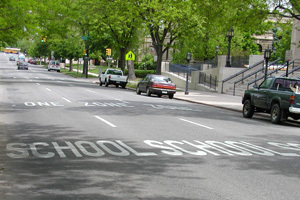 The principles and standards in the MUTCD provide information on appropriate design, application, and maintenance of all traffic control devices (including signs, signals, and markings) and other controls (including adult school crossing guards, student patrols, and grade-separated crossings) required for the special pedestrian conditions in school areas [Federal Highway Administration, 2009]. Some jurisdictions recommend or require school signs that are larger than the sizes of signs recommended by the MUTCD or may allow different types of pavement markings. School zone signs and markings on public streets must comply with the MUTCD as well as consider any relevant local or state guidelines that are themselves consistent with the MUTCD. Signs should be used judiciously, as overuse may lead to driver noncompliance and excessive signs may create visual clutter. Guidelines for making schools accessible to children with disabilities can be found in the Americans with Disabilities Act Accessibility Guidelines (ADAAG) and the Public Rights-of-Way Accessibility Guidelines (PROWAG). 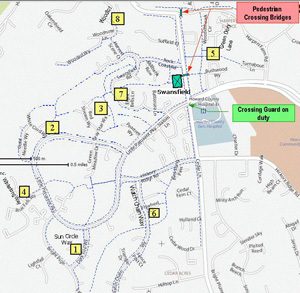 ADAAG applies to the school site itself whereas PROWAG addresses the route to school. The Department of Justice established the 1991 ADAAG as a standard, which means that compliance is required for all newly constructed or altered school facilities. Properly designed and applied traffic calming devices encourage good motorist and pedestrian behavior in the school zone. Traffic calming measures such as high visibility crosswalks, street narrowing and signage can be in place all the time. Since school zones are locations frequented by children, making the area safe and accessible for children anytime of day is a sound investment for the community. Properly designed and applied accessibility improvements, such as curb ramps, accessible pedestrian signals, and accessible sidewalks and pathways are also sound community investments. They benefit not only children with disabilities but also parents with strollers, senior citizens, and others with permanent or temporary mobility impairments. For more information on traffic calming in school zones visit the 2004 PedSafe Guide "School Zone Traffic Calming" Portland, Oregon, case study. This diagram from the MUTCD shows typical placement of school advance warning signs, school speed limit signs, school crossing signs, and “end school zone” signs. Signs and pavement markings provide important information to drivers to improve road safety. Examples include retroreflective yellow/green school advance warning signs and SPEED LIMIT 25 MPH WHEN FLASHING signs. Marked crosswalks help guide children to the best routes to school. The limited empirical evidence suggests that signs and pavement markings help educate drivers and improve driving behaviors in school zones. The cost for signs generally ranges from $100 to $300 per sign plus installation costs (Bushell, Poole, Zegeer, Rodriguez, 2013). Pavement marking costs vary by type of paint chosen and marking design. Schools should develop "safe routes to school" traffic control plans which include sign and marking recommendations. Traffic signs and pavement markings used on public streets and property must comply with the Manual on Uniform Traffic Control Devices. See Chapter 7 of the MUTCD for traffic control used in school areas. Signs should be used judiciously, as overuse may breed driver noncompliance and excessive signs may create visual clutter. Pedestrian and bicyclist conflicts in School Zone. School speed limit sign at Diggs-Latham Elementary School in Winston-Salem, NC. Image provided by Mike Cynecki. School flasher speed limit sign at Arrowhead Elementary School in Glendale, AZ. Image provided by Mike Cynecki. School speed limit signs alert drivers that they are entering a school zone and they need to slow down for school children. The MUTCD provides guidance for installing school area speed limit signs in school zones at a specified distance from marked school crosswalks or a certain distance from the edge of school property. 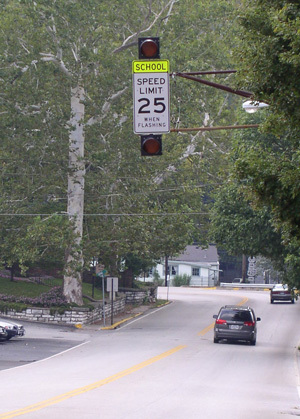 School speed limits vary based on state law and typically range from 15 to 25 mph. These devices are important but should not be overused. Excessive and unreasonable use may lead drivers to ignore the devices. Occasional police enforcement is also needed at these signs. School flasher speed limit signs are sometimes used on busy streets, where they can help attract drivers' attention to the school speed limit. School flasher speed limit signs that are activated only during school hours are probably more effective at drawing a driver's attention compared to school flasher speed limit signs that flash throughout the day [Federal Highway Administration]. Overhead school flasher speed limit sign at Second Street School in Frankfort, KY. Image provided by Mike Cynecki. 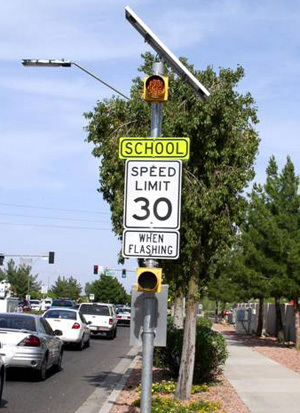 School flasher speed limit signs can be installed overhead for even better driver visibility than side mounted school flasher speed limit signs. The best uses for overhead signs and beacons are at locations where drivers cannot see the marked crosswalk due to topography or other unusual barriers, such as on the crest of a hill or around a curve. This solar-powered changeable message sign used in Mill Valley, CA is adjacent to a school and is only operational during the school commute periods. 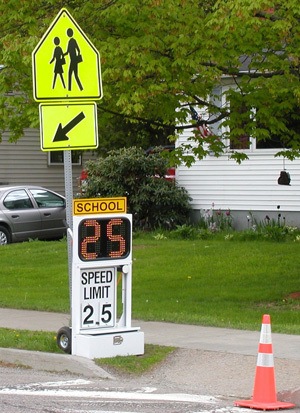 Permanently mounted changeable message signs are illuminated with messages or speed limits and are used to heighten awareness of speed limits in the school zone or to establish a lower speed during school crossing times. Both solar and non-solar units are available for less than $3,500 per sign (Bushell, Poole, Zegeer, Rodriguez, 2013). While the non-solar equipment is less expensive to purchase, it requires a hard wire connection to a power source, which can be much more expensive. One type of changeable message sign is a speed feedback sign which shows “Your Speed” and the “Speed Limit” to alert drivers to their actual speed and the posted speed limit. 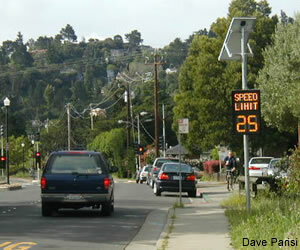 Speed feedback signs can record traffic counts and are programmed via a Personal Digital Assistant. They work best if they flash or provide a SLOW DOWN message if drivers exceed a preset speed threshold. Speed feedback signs still need to be used with other standard speed limit signs, which should be placed in advance of or next to speed feedback signs. Typical portable radar speed trailer. Portable speed limit signs are movable speed feedback signs that remind drivers of the posted speed limit. Radar speed trailers alert each passing driver to their traveling speed. These machines are used in some jurisdictions along with law enforcement. For example, the signs are put in place, parents are notified that law enforcement will be present, and then officers show up to ticket speeders and drivers who fail to stop for children in marked crosswalks. In other locations, signs are used with no further enforcement activity. Portable speed limit signs are discussed further in Enforcement. 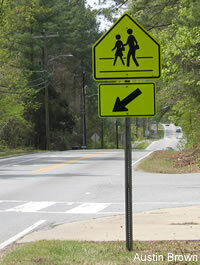 Example of a school crosswalk sign. 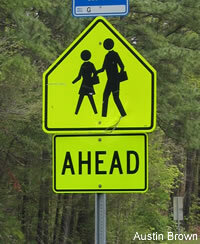 School advance warning signs and school crosswalk signs are important elements of a safe routes to school program. Chapter 7 in the 2009 edition of the MUTCD designates these signs to be used in advance of and at school crossings, and mandates use of fluorescent yellow green color sheeting for all new school warning signs. School advance warning signs must generally be used in advance of the first school crosswalk sign encountered by each direction of traffic. School crosswalk signs shall not be used at crossings other than those adjacent to schools and those on established school pedestrian routes. In addition, the school crosswalk sign shall not be installed at controlled crossings (where vehicle traffic is controlled by a STOP or YIELD sign). The MUTCD and local and state regulations should be followed when considering installation of these signs. They should not be overused or underused; and when installed, they need to be maintained and kept clear of tree branches and other visual obstructions. 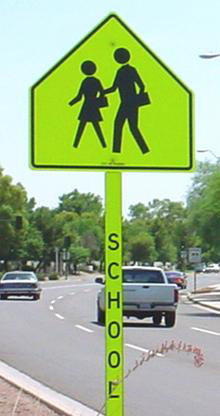 School warning sign with retroreflective yellow-green post covering in Phoenix, AZ. Image provided by Mike Cynecki. Retroreflective yellow-green post covers can be bolted onto sign-posts to draw additional motorist attention to school warning signs. This treatment is permitted in the MUTCD. Pavement markings at Morey Middle School in Denver, CO. Image provided by Mike Cynecki. Pavement markings, or stencils, are an effective way to enhance driver awareness near schools. They can be used to supplement regulations and warnings provided by traffic signs and signals, or they can convey regulations, guidance, and warnings independently. The use of pavement markings is governed by the MUTCD and by state regulations and guidance. In some cases, state regulations and guidance may differ from the MUTCD. For example, while the MUTCD requires white crosswalks and stencils, California calls for yellow crosswalks and stencils in school zones. Examples of stencils commonly used in school zones include SCHOOL, SLOW SCHOOL X-ING, STOP, and 25 MPH. Check with your local jurisdiction for guidance. Stencils should be checked annually. Installing stencils with thermoplastic or other plastic materials may cost more initially, but these materials will last longer than paint and reduce long-term maintenance costs. In areas that receive snow, consideration must be given to the fact that stencils may be obscured by snow during the winter months, and that regular plowing may shorten the lifespan of the marking. Parking restriction sign at Latham Elementary Schoolin Winston-Salem, NC. Image provide by Mike Cynecki. Parking restrictions are needed to regulate parent parking, but care must be taken not to push motorists into adjacent neighborhoods or deny parents appropriate and adequate space for parking and drop-off activities. 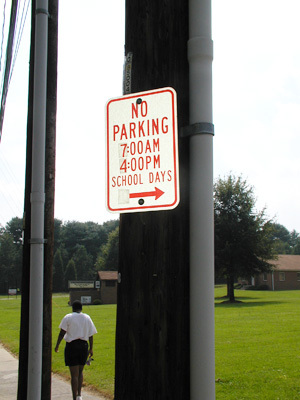 Curb paint and signs can be used individually or together to help convey messages regarding parking restrictions . For additional information, see Part 7 of the MUTCD.